Half the fun of the first Deadpool was checking out the long list of in-jokes, Easter eggs and playful pokes at other franchises. 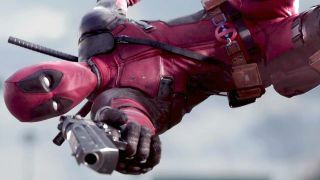 Deadpool 2 promises to ramp up the references even more, with Ryan Reynolds promising they’ll be there in abundance. Hey, there’s even a Merc with the Mouth Easter egg in his latest Instagram post. Go figure. Staying true to his word, if you click along the gallery of images, you’ll see his twin katanas embedded with the words ‘Bea’ and ‘Arthur’. Trust Deadpool to continue his love of 1980s sitcom Golden Girls by naming his weapons after one of its main actresses. In the first movie, Wade Wilson is wearing a Bea Arthur tank top just before he goes to play skeeball. No one references it, and Reynolds even donated $10,000 to a charity of Arthur’s family’s choosing to get permission to use her likeness. That’s dedication, folks. It’s highly likely that the hilt of those katanas will be glimpsed for nary a nanosecond in the final cut, so it just goes to show the effort everyone is putting in to make sure this is a real labour of love. If you’re aching for more Deadpool 2 news, you’ll be pleased to see these first images of Cable, complete with teddy bear, naturally. Don’t forget to check out Deadpool 2’s release date, either. Wouldn’t want to miss out now, would we?